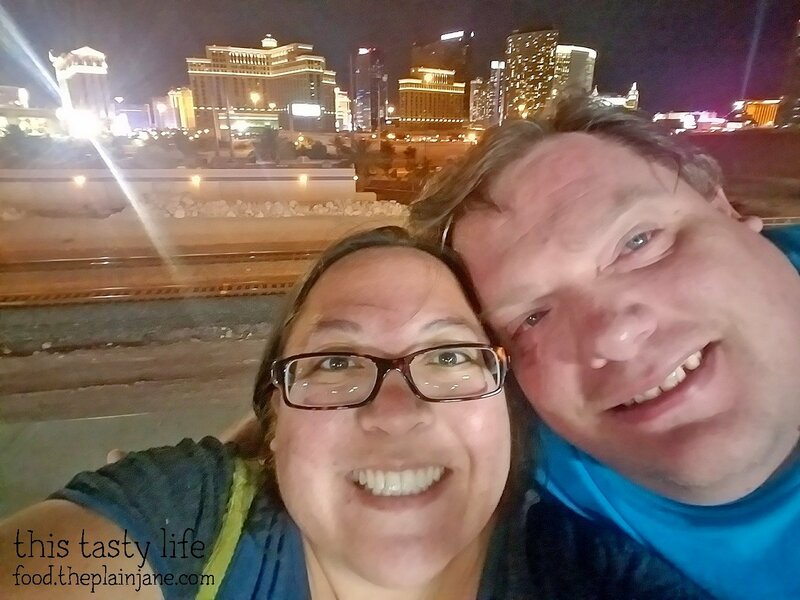 Jake and I recently ran off to Vegas for a mini vacation! This time around we stayed at the Rio which is just west of the Strip. 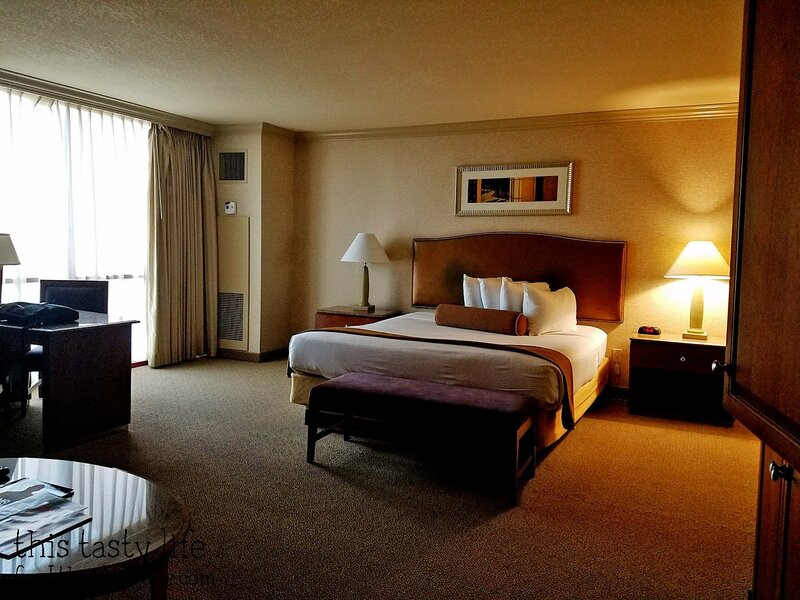 The nice thing about the Rio is that it’s an all-suites hotel, so the rooms are a bit bigger. Woooo Vegas! 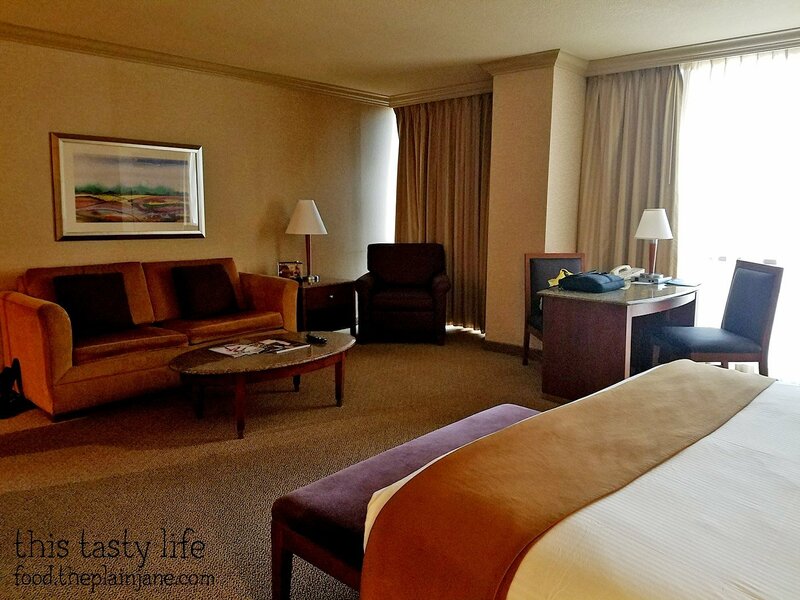 We killed time before checking in by revisiting a few foodie places that I’ve blogged about before, so I’m just going to skip to the new thing we tried our first night in Vegas. 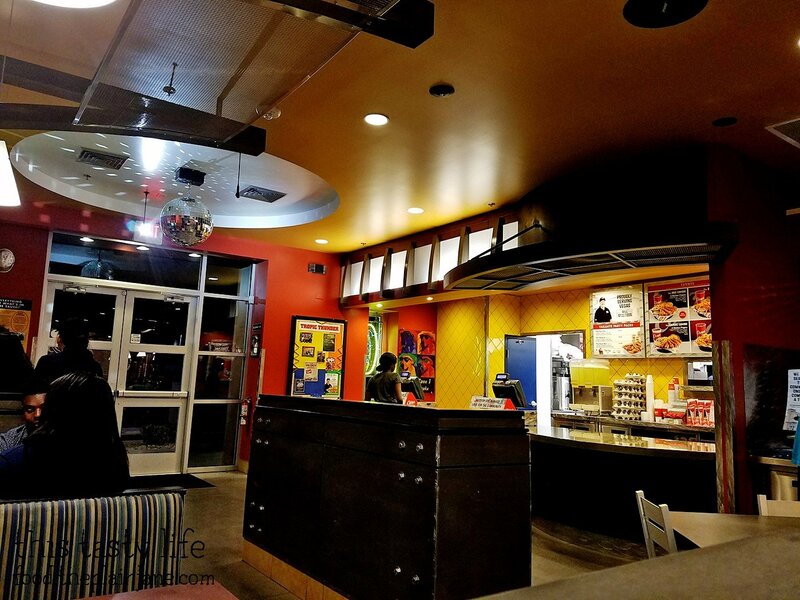 The first new thing we tried out is actually a chain fast food restaurant. Sounds weird, I know, but I’d read a lot of good things about it. The place? 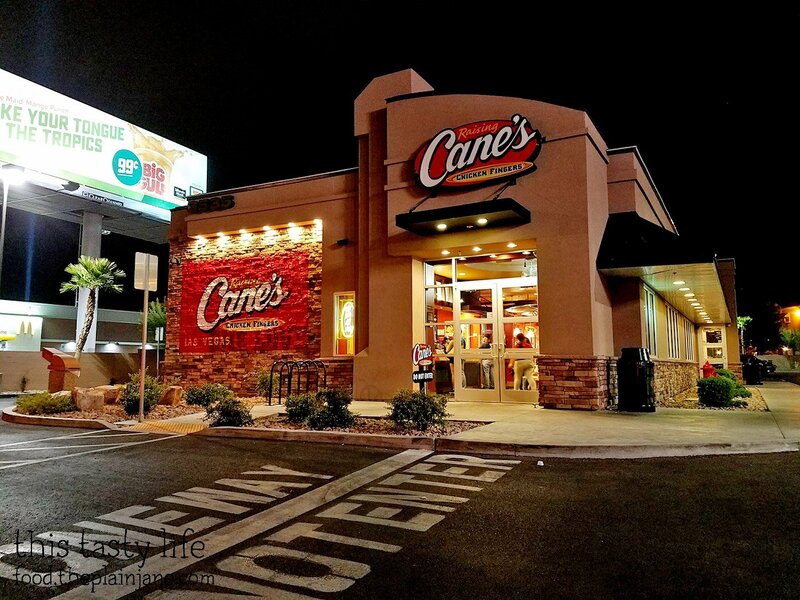 Raising Cane’s Chicken Fingers! Check out that disco ball! 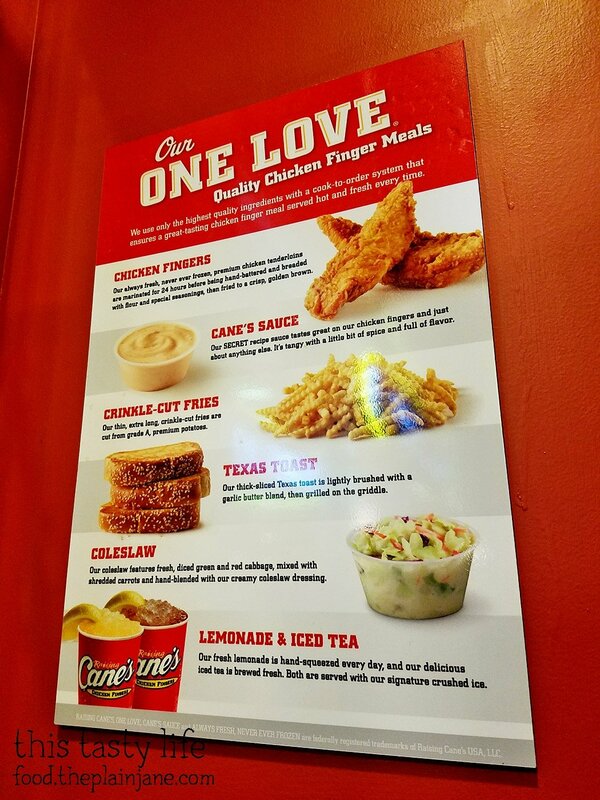 Pretty much the only thing they sell at Raising Cane’s is Chicken Fingers. There’s a variety of combos (3, 4, or 6) or you can get the chicken fingers in a sandwich. 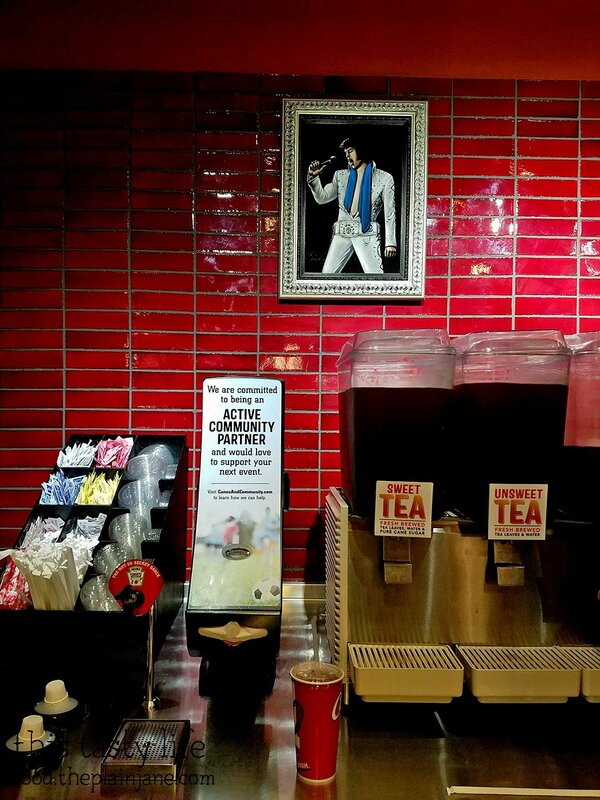 The drink area is spiced up a little with this black velvet painting of The King aka Elvis. A sum up of their menu. I noticed that there were a lot of photos of a yellow Lab in the restaurant and was tickled to learn that the restaurant was named after the founder’s dog. How sweet! Jake and I both got the Box Combo [$7.19] which came with four chicken fingers. We asked for double crinkle cut fries instead of the coleslaw since neither of us are coleslaw fans. 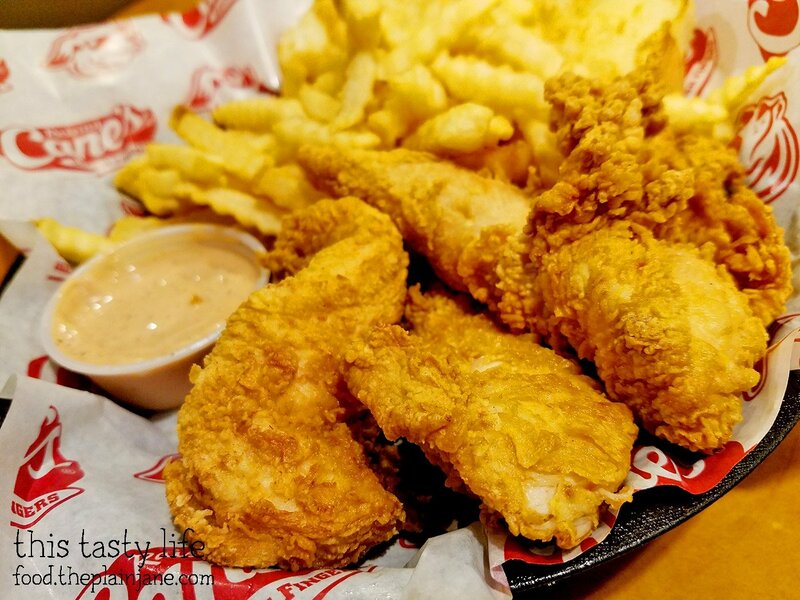 The meal also comes with a slice of Texas toast and a side of Cane’s sauce. You only get one cup. If you want additional sauce, it’s $0.29 cents a cup. Jake managed to get a free one from a worker who asked how our meal was and he gave him one on the house. The chicken fingers are made with white meat chicken and are never frozen. Each order is hand battered and made to order so the chicken comes out fresh. They use some kind of voodoo marinade to make the chicken incredibly moist and tender. The chicken and the batter is quite flavorful and insanely good. I was surprised at how moist the chicken was and that it was packed with flavor! 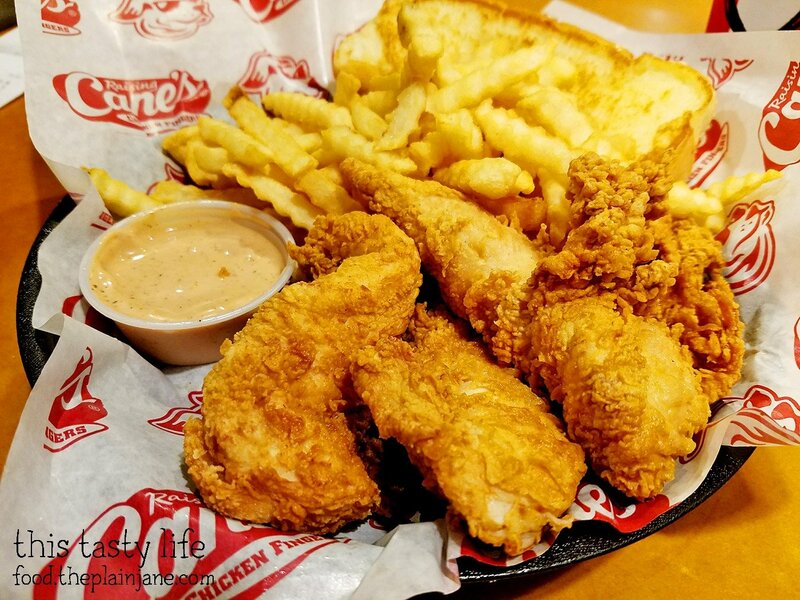 The included Cane’s Sauce is a delightfully flavorful combination. I have no idea what’s in that sauce, but it paired perfectly with the chicken fingers and the french fries. Yum! The only thing I didn’t really enjoy was the Texas toast. It wasn’t griddled long enough so it was on the soft side and there was kind of a weird flavor to it. It was almost a “tinny” flavor, like a weird chemical taint or something. It made the toast have a funky flavor. 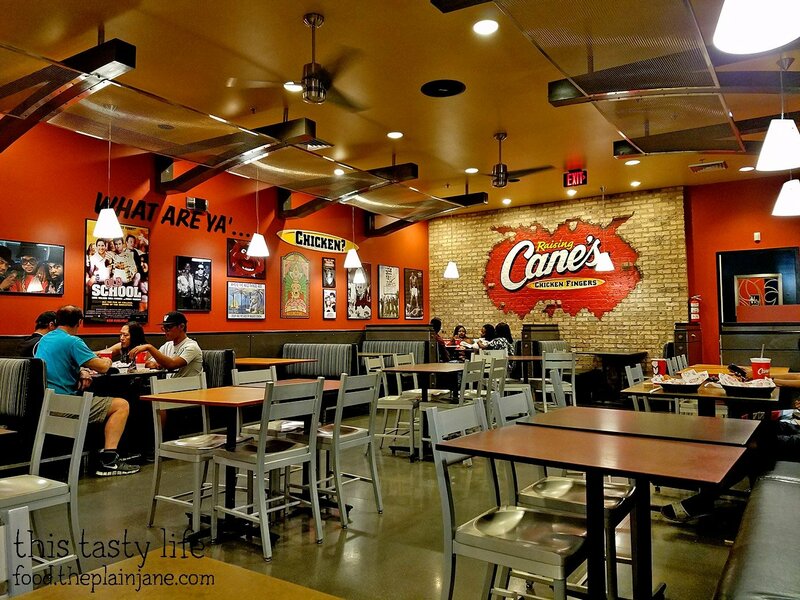 Jake and I were both surprised at how much we enjoyed Raising Cane’s and were happy to find out they will be opening a Raising Cane’s in Santee in 2018! I landed hard on my left knee with my left hand outstretched. Jake ran over to me to see if I was okay… but I had landed very hard on my knee. It began to swell immediately and my knee was skinned. I took this photo after my fall, with Jake holding onto me. I limped back to the car in tears. I was pretty upset at myself for my fall. We were supposed to play KISS themed mini golf after dinner! But considering I could just barely walk/stand, that was out of the question. 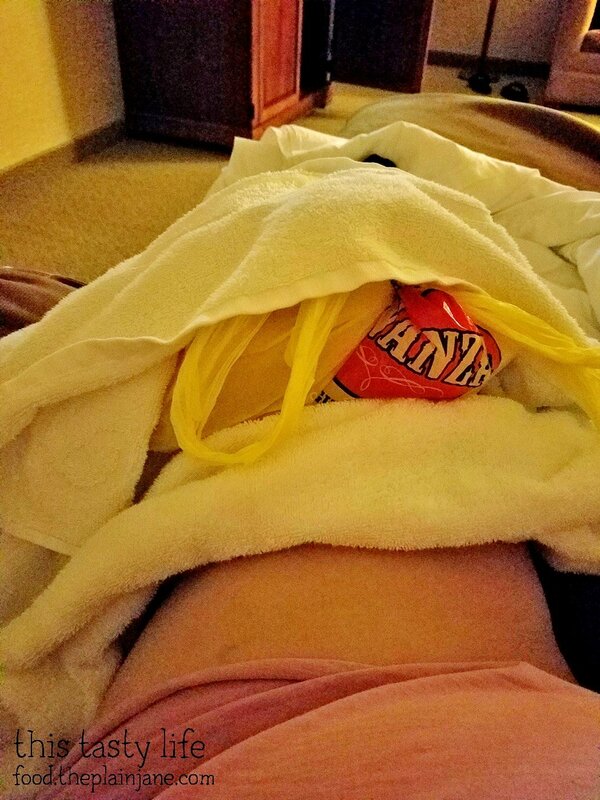 We got back to the room and Jake got me a huge bag of ice from the vending machine and I iced my knee and laid in bed. What a start to a vacation, eh?? Hope your knee was feeling better soon! 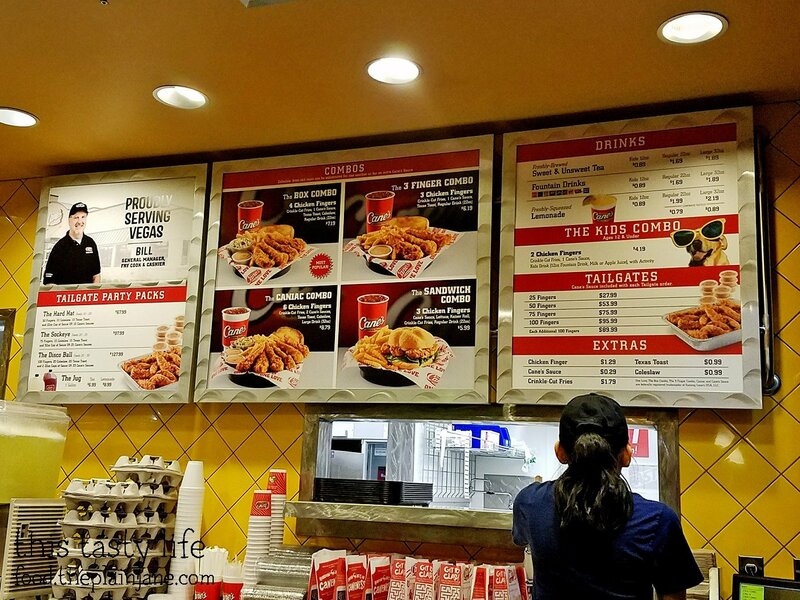 There’s a Raising Cane’s in Laguna Hills right off I-5. I tried it a few months ago, and thought the chicken was yummy. My knee is feeling better, thank you! 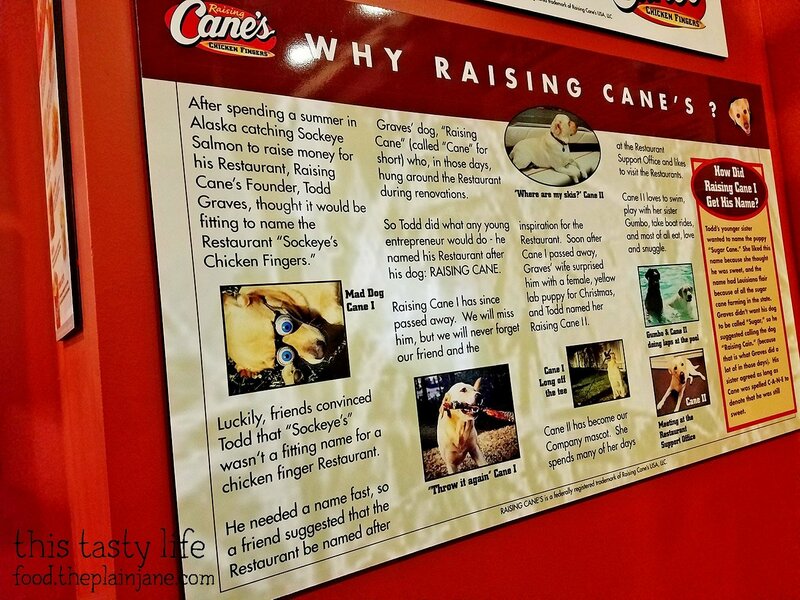 I did read there are Raising Cane’s in OC! I’m excited that one will be arriving in San Diego next year as well. Sorry that you got injured. That’s no fun, especially since you were on vacation. When this places comes to San Diego, we need to go! Aww, thanks. Silly me for not paying attention to what I was doing anyway. YES! We definitely need to visit when they open here! They have locations in Orange County, too.